Once threatened by the invasive European Starling, the Eastern Bluebird (Sialia sialis) is now thriving throughout much of eastern North America. 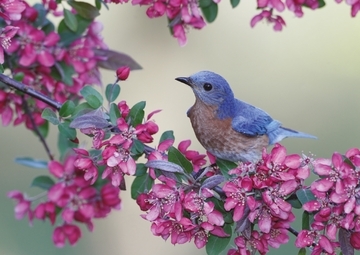 Community-established trails and nest boxes catered to this vibrant bird have spurred Eastern Bluebird populations to rise nearly two percent annually for decades now. Easy to see with their cerulean wings, you can often find this thrush searching for prey—they can spot insects from sixty feet away—from their perch on fences or in trees, such as this flowering crabapple.